Evolution is all about passing your genes on and it’s influenced your psychology to help that happen. For instance, we now find people with different genes attractive, helping us avoid inbreeding1. Many researchers also think that marriage evolved to help us reproduce. Sure enough, there is a lot of variety in marriage customs around the world. Perhaps each represents an adaptation to the local problems a group faces. For example, polygyny might be great when there are few men about because they’ve all been eaten by a sabre tooth2. However, just because you can think of a possible explanation doesn’t mean it’s true. So Riana Minocher and colleagues set out to gather actual evidence; studying societies’ “family tree”2. Their results confirm evolution is influencing marriage. Just not in the way you might think. During biological evolution a lot of different things that can happen. A trait may be beneficial, increasing the number of kids people have and so becoming more common over time (positive selection). 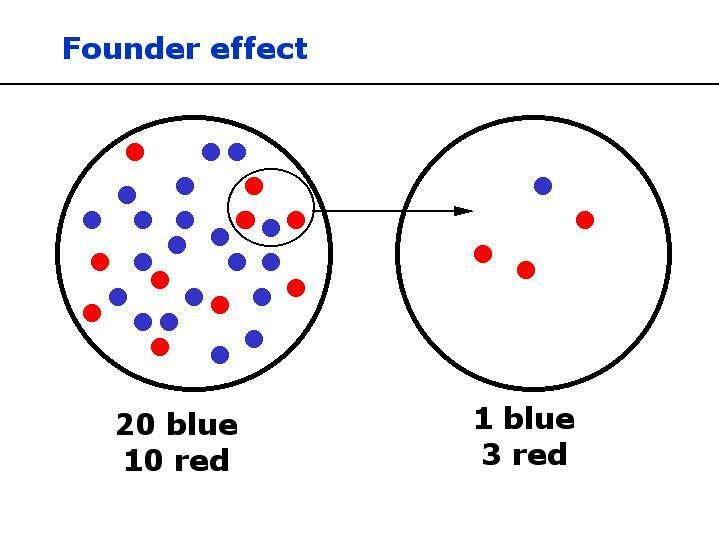 Alternatively, a harmful trait decreases reproduction, purging itself from the group (negative selection). However, sometimes the frequency of traits can change for no real reason. This is genetic drift. 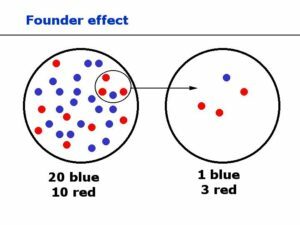 Basically, all of the random factors that can influence the course of evolution. Like maybe a meteor crushes everyone with a particular trait, wiping it out. Cultural evolution can also be influenced by a sort of genetic drift. Protestantism is dominant in the USA, not because it has some evolutionary advantage but because the first settlers were mostly Protestant. So, in a brilliant twist, these researchers built up a family tree of all the societies they were studying. This would help tease out whether patterns in marriage were down to a shared history, or had actually evolved for a reason. 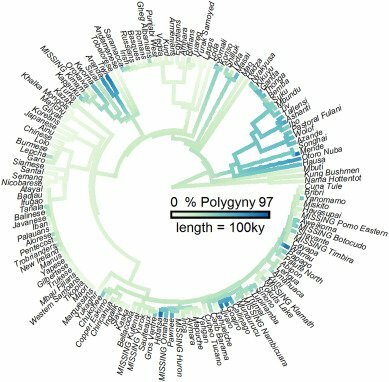 So after plotting out marriage practices across a family tree of more than 180 societies, this is what Minocher and team came up with. As it shows, the most polygynous societies are often closely related. This suggests their tendency for multi-female partnerships are the result of cultural baggage and not an adaptation for the local environment. For some random reason, people in the past started doing it and their descendants carry on with the tradition. Now, don’t take my word for it. Minocher et al. ran all sorts of statistical tests, discovering that cultural baggage was really a bigger factor than the environment or the number of males or a bunch of other stuff. So it seems that marriage is evolving, but that evolution is mostly through a random sort of “genetic drift”. Now, if you look carefully at the family tree you might notice that polygyny doesn’t always line up with history. Sure enough, it seems there are some forces that can drive a society to adopt polygyny, regardless of cultural baggage. Specifically, Minocher et al. found two circumstances that could make polygyny advantageous. First, if there was a lot of diseases around; perhaps because seeking out good genes is more important than the benefits of a single partner. Second, if there was a lot of male-male competition; maybe because the winners of the conflict get to have what they want. So that summary needs a slight amendment. Marriage is evolving, but that evolution is mostly random through a sort of “genetic drift”. However, positive selection does sometimes kick in, driving a group’s marriage practices in a specific direction in some rare circumstances. Winternitz, J., Abbate, J.L., Huchard, E., Havlíček, J. and Garamszegi, L.Z., 2016. 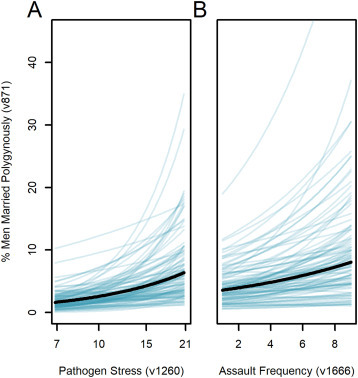 Patterns of MHC‐dependent mate selection in humans and nonhuman primates: a meta‐analysis. Molecular Ecology. Minocher, R., Duda, P. and Jaeggi, A.V., 2018. Explaining marriage patterns in a globally representative sample through socio-ecology and population history: A Bayesian phylogenetic analysis using a new supertree of human cultures. Evolution and Human Behavior.